Description: Another example of the spotlights spreading light for me. The render was only 20 minutes on my system. Ok, we get the green, red and volett on the sphere, subtle, but it's there. My qualms are with the red. 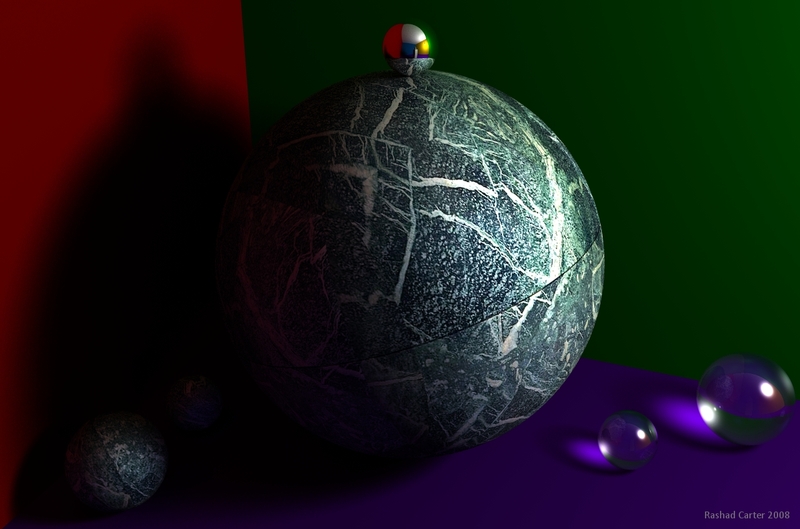 The ball casts a deep shadow on the wall and I would not expect that much bouncing light in reality. More so, because the blue is very faintly visible on the sphere and it is not in the shadow. To me this does not look like a Bryce render at first. The indirect light makes it look like another software. I understand where you are coming from Horo, but I think that because we are not accustomed to examining indirect light in Bryce we may not realize just how intense and colorful indirect light really can be. I know it seems odd at first, but if you render a similar scene in Carrara you will get more red than expected just as above. The issue comes in the fact that all of the light striking the sphere from the back is bouncing off of a red wall. Indirect light comes from all angles so the redness comes from the remainder of the red wall that is not in shadow. Yesterday I experimented with placing objects next to colored walls and I was amazed at just how much color bled over even when there were shadows present. Apparently, when light bounces it bounces in every direction as it strikes a flat surface, not just at 90 degree angles. This means that even though I disabled the red lights that fall directly into shadow, the rest of the wall still reflects red light in every direction shedding red onto the sphere. Perhaps I should lower the color saturation of the red spotlights so that it feels less intensely red, but I think the lights themselves are doing more or less what they should in the way of intensity or brightness. The idea of bouncing light is very foreign in Bryce terms and for me takes some getting used to. I have been comparing these scenes to real world enviroments and the results so far are consistent with my real world experiences. More tests to come. Aye, I agree that other than the poor caustic simulation this does not have the hallmarks of a bryce render. I am fairly convinced that the right level of bounce has been achieved but I find I am in agreement with Horo over the shadow in the blue area. Although, once I read Rashads explination I was convinced, when I went back to Horo's criticism I was swayed once more. I don't like to sit on the fence, so I will say, on balance I think that the shadow regions are a little too black for comfort. But it does look very good. I can see what you are saying Horo as the one done in Bryce the mirror ball had more light in it but also looks like and object that is not in the Carrara picture. The shadows are different because the light is brighter in Carrara test than the Bryce test. It is hard to have the settings set exactly the same to compare both programs but overall the Bryce bounce is looking good. This is a fantastic work, the textures are superb and the shadows fit perfectly. The artistic value far outweighs any minor imperfections, after all, art is the goal.